Create Grandma’s style chicken noodle soup in less than 35 minutes. This recipe is great for using up leftover chicken or holiday turkey. When people taste this soup they will think that you spent the entire day in the kitchen, slaving over the stove. With its golden colored flavorful droplets floating on the surface, rich with ingredients, this meal provides a taste that makes you think you’re eating Grandma’s homemade soup. This dish makes a delightful choice on those rainy chilly days or when needing a little help in fighting off the cold or flu. Oh yes, the youngsters love it too, making this another meal to get the kids eating healthy. In a large soup pot melt butter over medium heat and sauté carrots, onions, garlic and bay leaf for about 5 minutes while stirring occasionally. Add celery and continue sautéing for another 3-4 minutes. Now add the chicken broth and chicken pieces and bring ingredients to a boil. Add the noodles and reduce heat. Simmer soup for the amount of time needed to cook the pasta. Some egg noodles only take 5 minutes to fully cook. No matter what your choice of pasta is check the cooking times on the package so you know exactly how long to simmer the soup when cooking the pasta. Once pasta is cooked remove pot from heat. Remove bay leaf and add parsley, salt and pepper to taste. Makes 4 good sized servings. 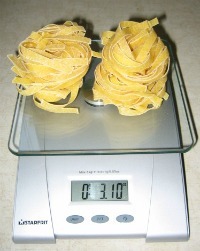 Different types of pasta require different cooking times. Check the package for cooking times to simmer the pasta for just the right amount of time. If you have no chicken broth handy substitute the broth for water and add about 3 chicken bouillon cubes for flavor. This recipe rocks when it comes to using up leftovers. Do you have left over grilled or rotisserie chicken or how about when you're left with a ton of holiday turkey? Of course you can always use fresh chicken or turkey meat as well. Just cook the meat in some broth or a frying pan before adding to the soup. 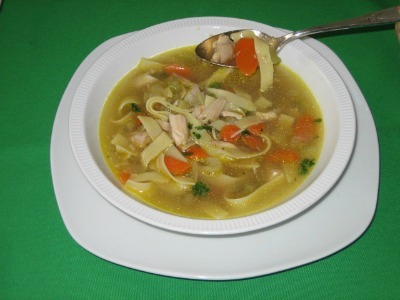 This is one of the fastest and tastiest chicken noodle soup recipes ever.